Last week, I summarized the Wisconsin Court of Appeals consolidated opinion in Hendrick v. Hendrick, No. 2008AP722, and State v. Skarzynski, No. 2008AP723 (Wis. Ct. App. Feb 10, 2009) (recommended for publication), which affirmed the order rendered by the Judge Francis T. Wasielewski of the Milwaukee County Circuit Court. In the paternity action, Skarzynski was adjudicated the child’s father, despite the martial presumption that the mother’s husband was the father. The District I Court of Appeals affirmed the trial court, holding that neither the martial presumption, nor the doctrine of estoppel prevented Skarzynski from being so adjudicated. In the divorce action, the appellate court affirmed the trial court decision denying Skarzynski’s motion to intervene. This week, my analysis of the decision. In the February 16, 2009 edition of Wisconsin Law Journal, news editor/attorney David Ziemer criticized the Court of Appeals’ decision. Ziemer wrote that, under Randy A.J. v. Norma I.J., 2004 WI 41, 270 Wis.2d 384, 677 N.W.2d 630, the trial court should have held a best interests hearing before testing under these circumstances. (Full disclosure: My law firm represented Randy on appeal). 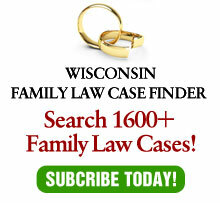 Ziemer points out that the statute is ambiguous and that a hearing should be necessary to discourage a husband from abandoning a marital child and to discourage meddling with intact marriages by potential biological fathers. As unusual as it is for me to agree with the Court of Appeals, its decision in Hendrick is consistent with the reasoning underlying Randy and other cases on the subject, including J.J. v. R.J., 162 Wis.2d 420, 469 N.W.2d 877 (Ct. App. 1991), and L.H. v. D.H., 142 Wis. 2d 606, 419 N.W.2d 283 (1987). In Randy, the Wisconsin Supreme Court held that Wis. Stat. §767.463, which allows a court to refuse to order testing, does not apply once testing has already occurred. The problem is an outdated statute. Years ago, when statutes such as Wis. Stat. sec. §767.463 were enacted, paternity testing was expensive and usually non-determinative. Today, paternity tests are widely available, sometimes even over-the-counter, inexpensive and can prove paternity to a probability of over 99 percent. (As an aside, handling paternity cases was much more fun prior to genetic testing!). Many times the “paternity” cat is well out of the bag before the case ever gets to court. These inexpensive, easily available tests, negate much of the intent of Wis. Stat. sec. §767.463, which is premised on tests needing to be court-ordered. In Randy, the Supreme Court held that since the statute did not apply, the trial court properly utilized the doctrine of equitable estoppel. The ability to use equitable estoppel, however, does not mean that it necessarily applies in every case. Therefore, the court in Hendrick was consistent with Randy by finding that the statute does not apply when testing already occurred. It was not inconsistent, however, because it did not utilized promissory estoppel against the mother. Rather, the facts of the case were substantially different: In Randy, the husband wanted to be the legal father; In Hendrick, the husband did not. The result in many of these cases seems determined by simple arithmetic: A child can have only one legal father – not more than one and preferably, not fewer. So, where there is both a husband subject to the marital presumption and a possible biological father (and they are not the same person) one of them, not more or less than one, will be the legal father. The legal father does not have to be the biological father: The law frequently recognizes a distinction between a legal parent and a biological one – adoption being the most common example. In cases such as the one presented in Hendrick, the court has a choice. Frequently, the choice is resolved because one man wants in and the other does not. It is rarely in a child’s best interests to have a parent who does not want to serve in that role. Where both men want to serve in the role, such as in Randy, equitable estoppel may resolve the issue, based on parenting and other actions up to the time of the litigation. It is where neither man wants to serve as father, such as appears to be the case in Hendrick, that courts have the most trouble. Perhaps the best solution was the one suggested by Justice N. Crooks in his concurring opinion in Randy. Justice Crooks would find that Wis. Stat. sec. §767.463 still applies and allow the court to make a determination based on best interests. After all, in an ever changing role, the one constant should be what is best for the child — regardless of the technological advancements at any given time.